(Los Angeles, CA – March 6, 2018) Originally released in 1985, Centerfield was John Fogerty’s third solo album and reached No.1 in the US, going multi-platinum. It features the perennial baseball season favorite, “Centerfield”, and the Top 10 Hot 100 hit, “The Old Man Down the Road”. On April 6, just in time for the baseball season’s opening week, BMG will reissue this fan favorite on vinyl featuring the original cover art, gatefold LP opening to reveal a bird’s eye view of a classic baseball field, with Centerfield painted in the grass. The LP will include the original nine tracks with a download card to access the two bonus tracks from the 2010 release. The CD features digipak packaging with the full 11 tracks (nine from the original release + two bonus tracks from 2010). Fans will also be able to celebrate a brand new season of America’s Pastime with exciting, limited edition Centerfield items! Pledge Music has exclusive bundles including Green Vinyl, felt pennants, baseball socks and more available to pre-order now. And on Record Store Day, April 21st, an exclusive run of Centerfield 12” picture discs will be released. This limited edition baseball image picture disc features the iconic title track on side A and the Top 20 hit, “Rock and Roll Girls” on side B.
Fogerty’s iconic anthem not only topped the Rock music charts in its day, but was also a Top 10 album on the Country charts in an amazing crossover success. The song “Centerfield” itself has been enshrined in the Baseball Hall of Fame in Cooperstown, NY, playing continuously throughout the halls as a reminder of the joy the game brings to fan and player alike. After the stress of a tumultuous lawsuit by his CCR peers, Fogerty took a nine year break from the commercial side of music. However, he wasn’t idle. In the time he spent on hiatus, Fogerty honed his musical talents and then returned to play every instrument appearing on the Centerfield album. Following another successful run at Wynn Las Vegas, which ended last month, Fogerty will return to the stage at the intimate Encore Theater for a highly-anticipated fourth engagement beginning this spring with additional dates this fall. Featuring his celebrated collection of Creedence Clearwater Revival (CCR) hits, the engagement will include 12 performances spanning May and October (Dates: May 2, 4-5, 9, 11-12 and October 10, 12-13, 17, 19-20). Fogerty will also join ZZ Top for the “Blues and Bayous Tour” this Spring, starting May 25 in Atlantic City before winding up on June 29th in Minnesota. 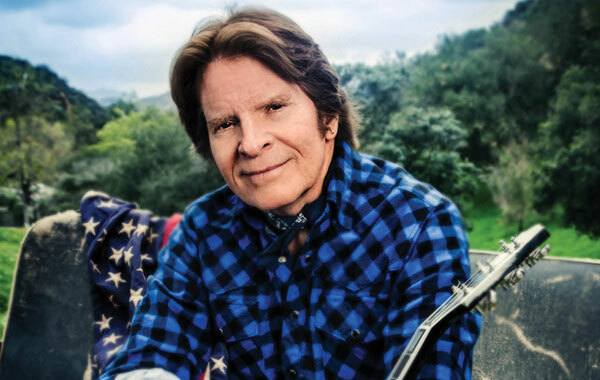 Fogerty is currently in the studio working on material for a new album to be released later this year via BMG.